Fajitas are a popular food segment in most parts of the country – especially the Southwest. However, most people do not know what authentic Fajitas are, or their origin. Unfortunately, most people associate the word "Fajita" as a catchall term for make-it-yourself tacos with some sort of meat, fish or vegetable with peppers and onions cooked in a skillet and served on sizzling plate gimmick that makes your clothes stink. Fajita is a TexMex word that means "little strap", "little belt", or "sash", and references the shape of skirt steak, which is long and thin. The Fajita story began in the middle 1950's where many "vaqueros" or Mexican cowboy ranch-hands worked along the Texas-Mexico border. To keep costs down, the vaqueros were paid $5 per day, room and board, and were fed the most inexpensive food. One day, the head vaquero on the Chapparosa Ranch outside Del Rio, Texas noticed that the butcher would cut the strap muscle, or skirt steak, off the cow and either throw it in with the scraps to be sold to dog food companies or sell it to customers for dog food. Because of the toughness and the large amount of tendon in the skirt steak, the butcher would not use it for ground meat. One day, the head vaquero asked the butcher if he could buy the skirt steak for his men, and the butcher began to save the skirt steak for the head vaquero each week. The vaqueros experimented with various ways of cooking and preparing the skirt steak and discovered the best way to tenderize and cook the skirt steak was to: marinate it in either lime juice or tequila to tenderize it, grill sear it over a mesquite wood fire so the tendon would draw up, and slice it across the grain to further decrease its toughness. 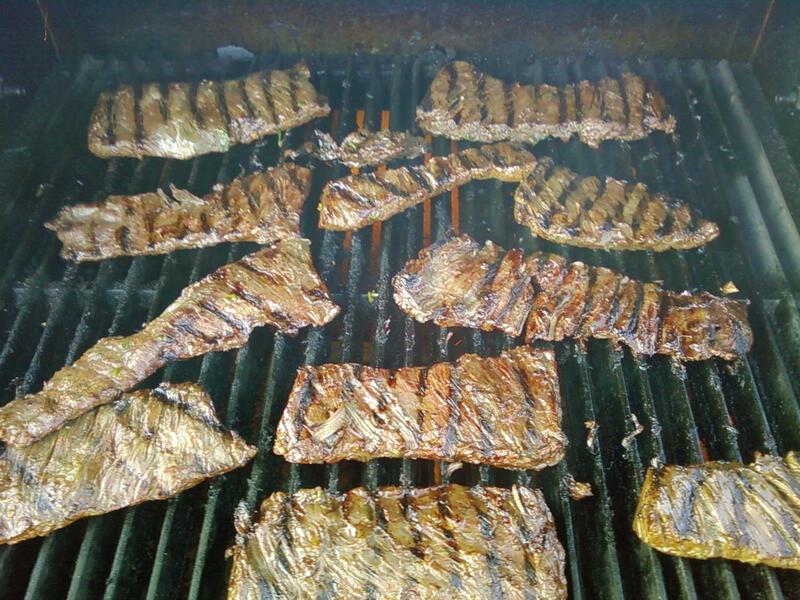 Over the next few years, skirt steak became the main source for beef for the vaqueros on the ranch. In 1969 the cook for the vaqueros began to visit county fairs and festivals and prepare a dish he called "Tacos al Carbon". When he applied to the Boerne Bergesfest committee in Boerne, Texas for a food booth in their annual festival, the Mexican social group in Boerne was already selling tacos. Unfortunately, the cook was denied because the Bergesfest committee had a rule that no one could sell an item already sold by other members. However, the next year the cook returned and applied for a booth and stated he was selling "Fajitas" – a name referenced the appearance of the skirt steak he used as a “little strap", "little belt", or "sash". No one with the Mexican social group knew what “Fajitas” were and stated they did not sell them – and that was the public unveiling of the "Fajita". Fajitas subsequently began to sell out every other food item at the Bergesfest, and after two years a local business man who owned an old vacant Dairy Queen in San Antonio made the cook an offer. The cook would use the old Dairy Queen and sell Fajitas and beer to local students at Trinity University. Over the next 20 years, Fajitas became a craze not only in South Texas but throughout Texas and the whole country. However, due to the large increase in demand, the price of skirt steak rose dramatically and restaurants began to cut many corners in offering authentic Fajitas by: (1) changing the true definition of a Fajita and substituting skirt steak with inferior beef cuts, chicken, shrimp and vegetables, (2) using light dry seasoning to flavor the meat, and (3) sautéing the meat in a skillet or sizzling platter rather than grill-searing it over a mesquite fire. The traditional meat for Fajitas is skirt steak, which is a thin, long, fan shaped cut from the beef plate (belly) primal. Like its neighbor, the hanger steak, skirt steak is one of the most flavorful of all steaks. Skirt steak is particularly delicious when marinated over a 24-hour period because its loose texture allows it to absorb flavors and its strong taste holds up to bold seasonings and hot searing mesquite flavoring. Today, virtually no restaurant outside of Texas offers authentic Texas-style Fajitas - tender juicy marinated skirt steak grilled over a hot mesquite fire. A simple meal of Fajitas, guacamole, pinto beans and salsa on a fresh lard-free flour tortilla is reasonably well balanced meal. Fajitas are a terrific source of protein, iron phosphorous, riboflavin, thiamin, niacin, and vitamin B-12. Properly trimmed Fajitas contain considerably less fat than typical fast foods such as hamburgers. The flour tortillas contain a variety of B vitamins, and both the guacamole and salsa contain vitamins A and C. If you bother to put cheese on the Fajita, you are not only adding calories, but a significant amount of calcium. So in addition to tasting good, Fajitas are good for you. Mesquite and South Texas seem to go together. While the Texas Hill Country around Austin boasts live oak, cedar, pecans, and on occasional cypress, South Texas is an unending expanse of chaparral - pure bush country. Mesquite and prickly pear seem to predominate in the vast open areas between San Antonio and the border. Settlers moving into the area first tried to subdue the tree, then gave up and learned to live with it - using the wood to make everything from railroad ties to furniture, and good clean burning charcoal. Mesquite is the traditional and ideal method for cooking Fajitas due to its very high 800 to 1,000 degree searing heat and the sweet honey woodsy taste it imparts on the skirt steak.